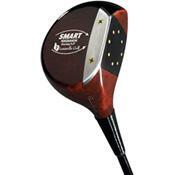 The Original Smart Driver is an excellent club for players who shoot in the 80s and 90s who sometimes have difficulty finding the fairways with metal woods. The gear effect is real. Shots struck on the toe or heel somehow almost miraculously find their way back into the fairway. I have seen very little loss of distance with this club, and my scores are lower because I spend almost no time in "the junk". It is so good, I have been tempted a few times to lay off shots and see what happens. The results are almost always satisfying. Wood drivers are great. Most players have no idea what the are missing. Excellent. Josh Fisher is a great guy and we enjoy the occasional chat. None this good. But I did like the Cleveland metal woods "way back when" before real wood came back into my life. Start thinking and stop reacting. High powered ad campaigns are fun, entertaining and seductive. The feel and playability of next-generation persimmon has me playing the most promising golf of my life. Put these clubs on your list. You will be very surprised.